Adult and Junior coaching is available at Mortonhall under the management of our Head Coach Dan Murray, a highly experienced and regarded coach. Programmes run after school and in the evenings. Dan also runs Active Schools sessions for local schools helping to encourage new players into the game. 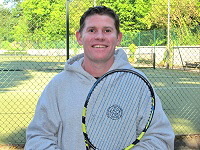 Dan has developed a thriving coaching programme at the club as well as strong links with local schools. Dan is also available for booking for private lessons, either for individuals or for small groups (e.g. 2 or 4 people). All private lessons cost £22 per hour. To book a private lesson, please contact Dan directly using his contact details below.